As an adolescent Bruce spent two years cruising with his father and brothers. Afterwards, settling in Northern California he led the Rigging Shop at Svendsens Marine from 1981 to 2000. During this time he restored his 1930 30sq Meter “Rumbleseat” (now based in Tortola as “Diva”). After winning many crewed, double-handed, and solo sailing races, including the 1996 Singlehanded Transpac aboard Rumbleseat, he retired from Svendsens to oversee the design & building of the all-American Open 60 OceanPlanet. After completing his first circumnavigation in the 2002/2003 Around Alone Race, he came to Portland, Maine to refit OceanPlanet for the 2004/2005 Vendee Globe Race (solo, nonstop, around the world). On February 25, 2005, Bruce became the first American in history to officially finish the Vendee Globe with a time of 109 days and 20 hours. Since then, Bruce has devoted himself to providing clients anywhere in the world with the best marine energy storage and charging systems through the business he developed in Bath, ME OceanPlanet Energy. Now living in the mid-coast town of Woolwich, Maine, Bruce is an avid bicycle racer and regularly plays his collection of acoustic guitars. 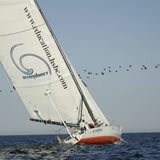 Julia grew up spending summers in Camden, ME where she developed a love of the ocean & sailing. In 2001, she earned her B.S. in Electrical Engineering then did a 3 year stint as an engineer before realizing she needed to spend more time on the water. She left the office and spent the next decade teaching expedition based sailing and semesters at sea. She joined the OPE Team in the fall of 2013. She holds a USCG Master 500 GRT Oceans and an ABYC Electrical Certification. 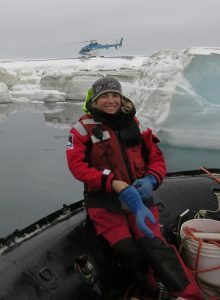 She continues to get her sea time fix by teaching Outward Bound sailing courses & supporting scientists on research vessels in Antarctica. She spends her off time traveling & adventuring as much as possible. Tom learned to sail on the New Meadows River in Casco Bay. After many years of travel, life in San Francisco, and a combined career as a musician, music educator, yacht commissioner and repair specialist; Tom returned to Maine with his family in 2002. Tom has worked in multiple capacities at a number of boatyards in Maine over the years and OPE was lucky to acquire his diverse set of skills in the spring of 2016. Tom holds an ABYC Marine Electrical Certification. When he is not working with OPE, he continues to share his talents as a musician (in multiple bands) and a music teacher. 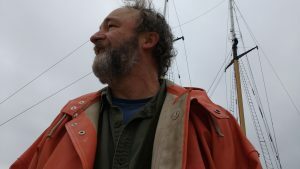 He also spends as much time as he can on his 32’ wooden schooner and pursues his interest in writing fiction and non-fiction. Brady learned to sail on Lake Michigan in 2011. Shortly after the purchase of an Ericson 35-2, he began a deep technical dive into sailboat repair and upgrade with a heavy focus on electrical system design and optimization. At the time his career focused on the design and support of cloud infrastructure for web hosting. 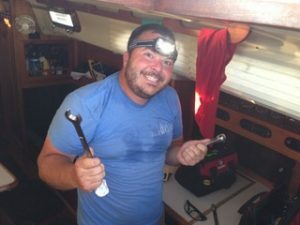 His decision to pursue his hobby and expand his marine electrical knowledge eventually led him to Portland, Maine in search of a new career in marine electrical design and new adventure cruising the amazing coast of Maine. Brady is a graduate of The Landing School Marine Systems Program, he holds a USCG Master 25 GRT Inland and an ABYC Marine Systems Certification.